Take Care of Yourself and Others! 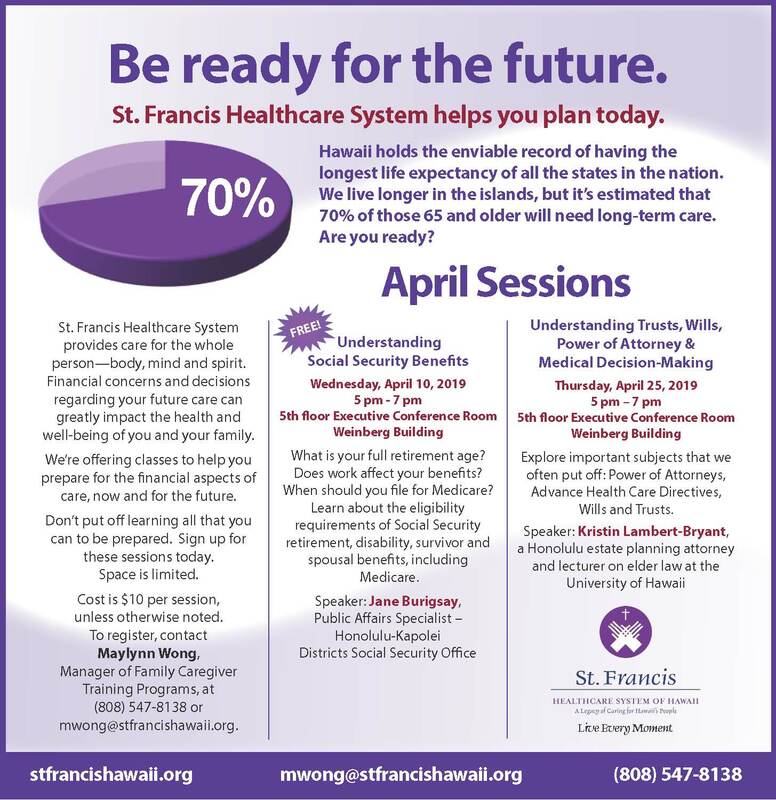 St. Francis Healthcare System simplifies the art of caring for yourself and those you love. 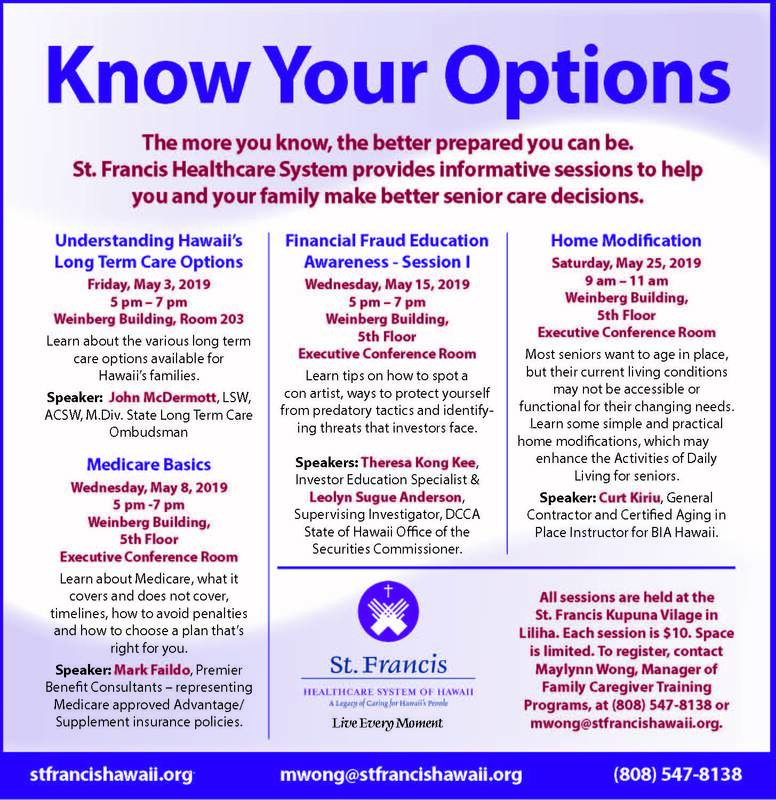 All classes are just $10 each and are held at the St. Francis Kūpuna Village in Liliha. Please refer to the course details and dates below. How did you hear about Caregiver Support? Which St. Francis programs have you been involved with? Do you sometimes have difficulty speaking English? Do you sometimes have difficulty understanding English? Are you an immigrant, refugee or new arrival to this country? Have you ever served on active duty in the U.S. Armed Forces, military Reserves, or National Guard? Please provide the following information to assist the instructor in preparing for the class. Who are you caring for? (e.g. Mother)? How old is your loved one needing care? Are you providing care with the help of others or by yourself at home? Does your loved one receive any services from the community? Please select the number corresponding to your loved one's ability to perform the following activities on a 1 (DEPENDENT) to 5 (INDEPENDENT) scale. Maylynn Wong at mwong@stfrancishawaii.org or (808) 547-8138. Is your billing address different than what is listed on page one? has received payment, we will provide an email notification of completed course registration. Please bring your cash payment with you to class.